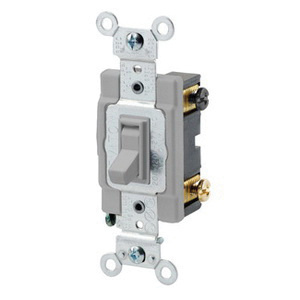 Leviton Commercial/specification grade toggle framed AC quiet switch in grey color, offers top performance and outstanding reliability in commercial settings. 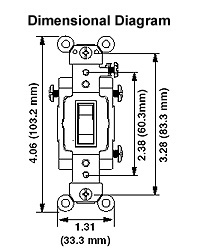 This 4-Way switch has heavy gauge steel mounting strap for rust resistance. The switch has polycarbonate body and toggle. It accepts #14 to #12-AWG copper or copper-clad wire. This switch has a voltage rating of 120/277-Volts AC and current rating of 15-Amps. The toggle AC quiet switch meets UL, CSA, File #LR-3413, NOM #057, Federal WS-896, File #E-748, NEMA WD 1 and 6 and ANSI standards.